Ambiance can be created by installing a dimmer switch so you can crank up the light when you are getting ready for the day and dim it when you want to relax and nurture yourself. Have a way to play soothing music (that is of course, powered in a safe manner), and bring in candles, bath salts and herbal soaks to treat yourself to a spa night at least once a week. Then put on your music and just chill! Tell your family this is your spa time and you are not to be disturbed. You will be training them to honor and nurture themselves by example! Bathrooms have a lot of water, both running water, and in mirrors, which represent water in the five elements theory. Working with the five elements is an important component of Feng Shui. In the controlling cycle, earth is stronger than water and will control it when it is excessive. Bathrooms often have an over abundance of water creating an elemental imbalance. You can add the earth element to it by adding golds, yellows and taupes to the wall color, or in the color of towels, rugs, pictures and bathroom accessories. Don’t be afraid to paint small bathrooms darker earth tones. I loved my small terra-cotta bathroom and brought in fluffy white spa-like towels and rugs to bring in a lighter contrasting color. It was my favorite room of my home and I loved my magical spa nights. I would light twinkling white candles all around my bath and luxuriate in the sumptuous space I had created. We want to balance all of the five elements in every room in our home, and the bathroom is no exception. To learn more about how to do this, please sees my article on the Five Elements as well as my article on the Power of Color. 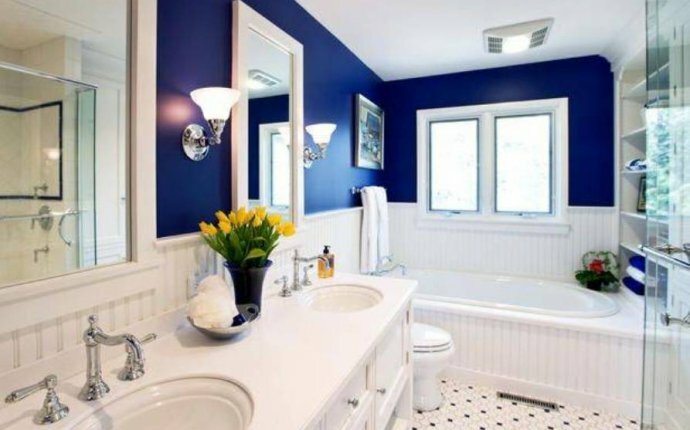 Since bathrooms are often smaller spaces, you can bring in all five elements by just adding one picture. Here is how to do it; the square picture represents earth, a black frame will represent water, a white mat will represent metal, a plant in the picture will represent wood and something red in it will represent fire. Or you can simply find a picture with the colors black, white, green, yellow and red and you will have all of the elements represented.